As confident as I was with that statement, I never thought they would make me so proud so soon. The Rockets trounced Cleveland for probably their most impressive win of the season, firing on all cylinders and playing solid defense yet again for a 93-74 victory. I felt a whole bunch of Houstonians jump on a bandwagon Thursday night. Without having to defer to, or tolerate, McGrady’s erratic shot taking, Yao Ming is clearly the #1 option on offense now (maybe for the rest of his career in Houston), and Thursday’s game in my mind was a statement game that has made it obvious that this is HIS team. There’s no more confusion among his teammates about who needs to get the ball. No more egos are distorting that view. It’s Yao time. Yao throws one down from under the basket after a dish from Kyle Lowry. He proved it by dominating a very good Cleveland team with 28 points on 13-of-15 shooting. His turnaround jumper from the post was automatic, and it’s clear it has become his patented move – a la Hakeem’s Dream Shake or Kareem’s Sky Hook – that can carry him into the Hall of Fame. It’s almost unstoppable because it really can’t be blocked. 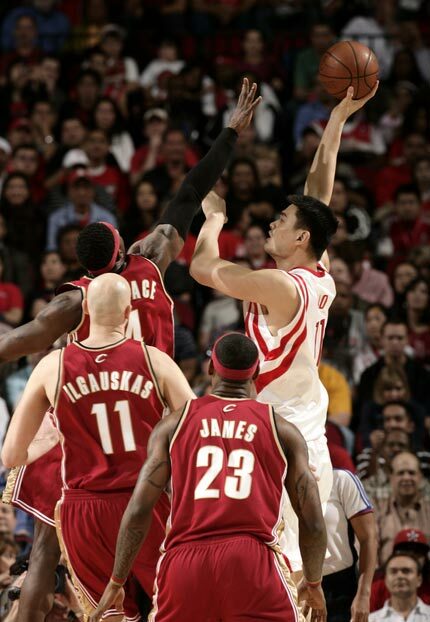 Even though this shot isn’t Yao’s turnaround jumper, it’s another shot that’s almost just as unblockable. Meanwhile, Lebron James was held by Shane Battier (4 blocks, drew a couple of charges) and Ron Artest to one of his most blah games of the season: 21 points on 7-of-21 shots. And in 40 minutes, he also failed to get an assist for the first time in his NBA career, and only had 1 REBOUND. I think Hell just froze over. I said a few games ago that the Rockets should not have been toying with the idea of trading Artest before the All-Star break, and that they should do everything in their power to sign him to a longer term deal before he gets tempted in free agency to leave. The guy lives up to his self-proclaimed warrior reputation. With him manning up Lebron, you actually have to feel even more confident that a guy with a body as close to Lebron’s build can actually hold his own against him. That can’t be said very often for whoever is assigned to defend the King. And did you see the crossover that Ron-Ron threw on Lebron to fake him out of his jock, followed by blowing past him into the lane, then dishing off to Yao for a dunk? That got the Houston crowd to ooh-and-aah. And how about that one-handed tomahawk jam with his left hand with about 4 minutes remaining in the second quarter. That got the bench and fans up off their feet after that one. The man is fun to watch. Under the radar who gave Cleveland’s defense fits, especially Ben Wallace, was Luis Scola in the lane faking out the former Defensive Player of the Year to score on whirling dirvish moves a couple of times. That’s impressive. I didn’t think Scola could play so well in the lane against a real physical defender like Big Ben. Luis never ceases to amaze me. He finished with 14 points on 5-of-7 shots and led the team in rebounds with 9. Vonnie “the Microwave” Wafer scored 19 points, with 14 coming in the fourth quarter alone as Houston held off a late push by the Cavs, only to see Von finish ‘em off. It was kind of a coming-out party for Wafer to a national TNT audience, many who had never seen him play before. He made a great first impression to casual NBA fans by hitting 4-of-6 three-pointers. As great as they played on offense, their defense was even better. They held the Cavs to the lowest number of points in the first and third quarters, 11 and 10 points respectively. Oh my goodness! I’ve heard of one low scoring quarter like this for an NBA team in the same game, but for two of them to occur in the same game is unheard of. And 33.8% shooting for an NBA champion contender? Houston’s defense is baaaaack. It’s unbelievable that Charles Barkley said after the game that he doesn’t think Houston is a contender, even after this big victory. And before the game, I don’t know why he and Kenny Smith kept saying that trading Rafer Alston was going to mean a big drop-off in production for Houston’s offense. And that they didn’t think Brooks was ready to run a team because he’s too inexperienced. Have they been watching their former team at all this season? Shane Battier and Yao Ming defend Cleveland’s LeBron James as the Rockets stingy defense limited the Cavaliers to 38.8% shooting. On the offensive side of the ball, Houston’s leading scorers of Yao and Tracy McGrady had a terrible night shooting, but Houston’s role players came through to help Houston win their 9th game in a row on the road and overall. Click here for more photos from the game. In the city where you can visit the Rock-and-Roll Hall of Fame, it’s appropriate that the Rocket “role” players were the guys who stepped up as Houston’s band leaders went AWOL. It didn’t look good as the Rockets started off the game shooting 1-for-9, getting down 10-2 early, then they made only 2 of their next 9 shots. Then before finishing the first quarter, they hit 3 of their last 5 shots to get their field goal percentage to 26%. Shockingly, the Rockets led 21-20 at the end of the quarter thanks to good defense. LeBron was 0-for-6 in the first quarter with 3 points, and in the second quarter he missed his only shot to go 0-for-7 by halftime with only 7 points. Incredible that the NBA All-Star MVP would get shut out from the field like that. But he wouldn’t be the only highly paid player to lose his shot in his first game back from the All-Star game. For example, let’s take a look at Yao. In his previous 4 games, Yao has been so solid and consistent, it was actually getting a little boring. How many different ways can you say a player is playing great? There really wasn’t much you could complain about during that 4-game stretch: 25 ppg, 59.7% shooting, 13 rebounds per game. But on Tuesday against Cleveland, other than his free throw shooting (10-of-10) and rebounding (14), he played one of his worst games of the season shooting an unbelievable 3-of-17 shooting from the field. It was so bad, he was blocked a few times and even missed an uncontested dunk that clanged off the back rim to go out-of-bounds. Yao Ming blocks a dunk attempt by LeBron James on Thursday night in Houston. Yao led all Houston scorers with 22 points. He also grabbed 12 boards in a 92-77 Houston win, their fifth in a row. Click here for more photos from the game. Click here for photos of Yao at the pre-game shootaround. Since Thursday’s night game between the Rockets and Cavs was nationally televised in the U.S., many of you probably saw the game, so you probably don’t need me to rehash alot of it. So I’ll just mention some of the key takeaways from the game along with a few other thoughts. Coming into this game, I was a bit worried that the Rockets were finally facing some tough competition — last year’s NBA Champion runner-up — compared to the Milaukees, Indianas and Minnesotas of the world. Cleveland also has a very similar record as the Rockets, and the Rockets have a worse record at home than they do on the road. So there were enough red flags here to be concerned. It really hurt the Cavs that Drew Gooden, Anderson Varejao, and Sasha Pavlovic couldn’t play. Because of that and the fact they gave the Rockets plenty of chances to take the game, the Rockets took it, winning their fifth game in a row by beating Cleveland 92-77 despite not playing that well at times. Yao throws one down in Cleveland Monday night in his first game back from a leg injury in 32 games. He scored 16 points, grabbed 11 boards and blocked two shots, but a controversial no-call against him was the deciding factor in a 91-85 loss. Click here for photos from Yao’s pre-game activities, and here and here for photos from the game. As great as it was to see Yao Ming return to the court Monday night and score 16 points, grab 11 boards, and block 2 shots (close to my prediction of 17 points, 9 boards and 2 blocks), it also brought back some not-so-great memories – seeing Yao get physically abused and the refs not calling fouls against his defender(s). It happened again in Cleveland, this time in a crucial part of the game. The score was tight: 86-82 on the Rockets’ end of the court with 1:02 remaining. Yao had grabbed a long rebound around the free throw line, took one dribble toward an undefended basket, and had a great chance of scoring. That’s when Cleveland center Zydrunas Ilgauskas threw his body in front of Yao with a half-hearted attempt to swipe the ball away. Ilgauskas fell to the floor in front of Yao in what the Cleveland TV announcer described as an NFL-like “chop block” (which is illegal, by the way), and forced Yao to topple to the court and lose possession of the ball. Thank God that Yao was able to fall and avoid landing on his rehabilitated knee. However, no foul was called. Instead, play continued, Cleveland pushed the ball up the court and LeBron James capped off the fast break with an alley-oop slam to make the score 88-82 with 57 seconds remaining, which was too big of a deficit for the Rockets to overcome. I’m so frustrated, I could rant for paragraphs about it, but I’ll move on. Yao tries to keep Lebron James from scoring Saturday night, but with no success as James prepares to throw one down. However, it was one of only 7 shots that James made in 22 attempts. Meanwhile, Yao finished with 24 points and 5 rebounds in leading the Rockets to an 81-63 win over the Cleveland Cavaliers. Click here for the game story. Click here for more photos. This is probably the latest commentary I have had after a game, more than 24 hours after the fact. I spent the past day at my folks’ house helping out with a very ill relative, and didn’t have access to TV during the game, but was able to watch it on Tivo late Sunday night. I’ll probably have a similar schedule during most weekends in the foreseeable future. With that said, it was a thing of beauty to see team defense play such a big part early in the day when one of my favorite teams – the UCLA Bruins football team – shock the world and the 14-point favored USC Trojans by knocking them out of the BCS National Championship Game by holding them to the least number of points this decade. Later that evening, defense was the overwhelming factor that led to the Rockets dismantling of the Cleveland Cavaliers’ offensive attack, holding them to 28% shooting for the game. It probably would have been worse if the Cavs hadn’t cut a 26-point deficit in half late in the fourth quarter. After Houston had gone scoreless during a Cleveland 13-0 run, though, the Rockets righted the ship and scored 3 baskets in a row to put the game out of reach, winning 81-63. I’m sure you know by now that T-Mac suffered a concussion after running into Dikembe Mutombo‘s elbow accidentally. It looked scary at first, with McGrady totally out of it. But then later on it was reported that he doing much better after the game, joking and smiling in the clubhouse. It’s uncertain if he will play in Tuesday’s game against Golden State. T-Mac actually had a great start before getting hurt late in the first quarter, scoring 7 points on 3-of-5 shooting and doling out 3 assists in just 10 minutes of play. The Rockets went on a 14-1 run without T-Mac at the end of the first half, holding the Cavs to no field goals for 8 ½ minutes. Yao had scored 20 points by halftime, and the Rockets were comfortably ahead 43-29 at the half. Shane Battier did an amazing defensive job on Lebron James, who was only 4-for-16 at one point in the third quarter. King James finished 7-of-22 for the game. With the ‘playmaker’ McGrady not able to dish some assists to Yao for dunks or layups because of his concussion, Yao did not get easy looks (finished only 8-of-23 from the field) and only scored 4 points in the second half. But the Rockets didn’t really need him much in building a 26-point lead. When the Cavs cut it close, Rafer Alston and Luther Head came up with some clutch shots as they have done most of the season and put the game away. Head was especially outstanding, hitting 3-of-6 three-pointers (13 points), grabbing 7 rebounds, and passing 5 assists. And he only had 1 turnover in 31 minutes. Overall, it was an ugly game since the Rockets only shot 39% from the field, but on a day when defense made headlines on the West Coast, the Rockets applied their own smothering defense on the Gulf Coast. LeBron James runs into Yao on Sunday. James, the #1 pick in the 2003 NBA draft, was finally able to beat the Rockets and Yao, the #1 pick in the 2002 draft. James scored 36 points while Yao scored 27. Click here for more photos from the game. SUNDAY, 3/26/06 – The Rockets (30-39) fought valiantly against Cleveland (40-29) Sunday afternoon. Houston’s Keith Bogans and Rick Brunson were providing a nice scoring bonus by hitting lots of three-pointers (4-of-5 and 2-of-2, respectively). With that kind of offensive outburst, you had to think the Rockets’ chances were good to win their second game in a row. Indeed, there chances were very good. The Rockets had a 13-point lead at one time in the third quarter with their offense finally humming like we hadn’t seen in awhile with T-Mac out of the lineup. But Houston couldn’t put the Cavaliers away, couldn’t make big defensive stops down the stretch, and disappointingly lost their fifth straight at home in overtime, 104-102. The Rockets made a few preventable defensive blunders that cost them the game. I’m not saying they were out-coached. However, I still wonder why Jeff Van Gundy insists that Yao come out to the top of the key to help apply defensive pressure on the man with the ball. That seems to risk leaving the middle open and tiring out the Big Man a little too much. That defensive plan may work against players who can’t penetrate into the lane, but when you’re doing it to freakin’ LeBron James, it’s probably going to cost you leaving your top shot blocker out of position to defend the rack. It happened twice late in the fourth quarter, and both times LeBron took it strong to the hole for a layup and a dunk. The other defensive mistake took place with the Rockets holding a three-point (91-88) with 25 seconds to play. You would think if the situation looked like the Cavs were close to getting an easy shot, all they had to do was foul the man with the ball to keep him from scoring. Good for you, Yao. Speak out when the refs blow a call. I’m not blaming you on that one. However, I do blame the fact the Rockets gave LeBron an opportunity to go to the hole, especially with a foul to give! 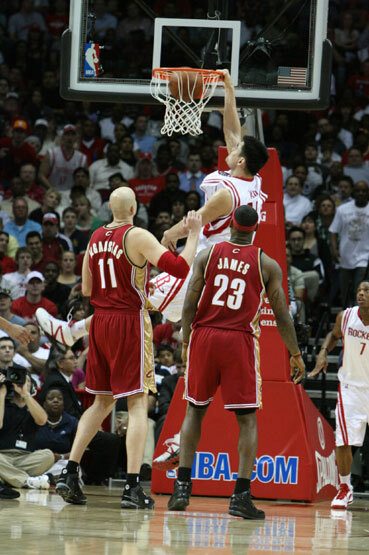 The Rockets had a chance to win it on the ensuing possession, but Yao turned the ball over down low. Yao atoned for the mistake by scoring 6 points in OT. But LeBron showed his greatness once again. With less than 15 seconds remaining King James penetrated into the lane, drew Yao over to his side of the court, then astutely dished to Zydrunas Ilguaskas for an easy jam to put the Cavs up 103-99 with 9 seconds remaining. Even by keeping Yao down low in the lane, it still didn’t work. That’s what great players like LeBron do: draw the defense to them, then pass off to other players for layups or dunks. Yao came back to hit a jumper to make it 103-101 with 7 seconds remaining. The Rockets then fouled Damon Jones intentionally and put him on the line. The gamble paid off. Jones missed a free throw, and the Rockets had a chance to tie the game with a three-pointer. But that’s when Cleveland’s coach Mike Brown opted to do what Jeff Van Gundy didn’t do in regulation: he intentionally fouled Rafer Alston, putting him on the line with .6 seconds remaining. Alston made the first free throw making it 104-102, then purposely missed the second hoping a miracle rebound and shot could tie the game. But the ball was swatted out of bounds as time expired. The main stats they lost were offensive rebounds (14-to-5), turnovers (17 vs. 9), and points in the paint (46 vs. 28). LeBron finished with 36 points, although Bogans did a decent job holding him to 14-of-34 (41%). Yao led all Rockets with 27 points and 4 blocks. He also grabbed 7 boards. But he did have 5 turnovers and was 9-of-21 from the field. However, to reiterate, you can’t blame Yao for this loss. Blame it on LeBron’s greatness, and perhaps a flawed defensive strategy that gave him easy shots up close down the stretch. Yao contests the shot of Cleveland’s Drew Gooden Thursday night on the Rockets way to a 99-80 victory in Houston. Yao scored 13 points, grabbed 8 rebounds and had two blocks in 24 minutes of action. Click here for more photos from the game. THURSDAY, 3/24/05 – When Vin Baker plays it only means one thing: blowout. Coming off a close 2 point win over Miami, the Rockets strolled to a huge win over Lebron James and the struggling Cavaliers with a 99-80 victory. In the first quarter, the Rockets fell behind early, but went on a 15-2 run to take a 19-11 lead, capped by a sweet bounce pass from Yao in the post to Clarence Weatherspoon who cut down the middle of the lane for a layup. I hadn’t seen a nifty pass like that from Yao in a long time! T-Mac scored 8 points in the quarter, including three baskets on incredible slicing moves to the basket, and a 360 move under the basket where he amazingly got the ball off in mid-air for a layup off the glass. That bucket brought the sellout Houston house down! Yao scored 7 points on 2-of-2 shooting in the quarter. It was all knotted up at 28-28 after one quarter, with both teams shooting .500 or better. In the second quarter, T-Mac blew quickly into the lane from the top of the key and threw down a right-handed dunk over Drew Gooden that no one believed he had the quickness to get off. He was so quick, he froze two defenders down low who had no idea how to defend it. Also in the second, Yao had an incredible block from behind of Cleveland center Zydrunas Ilgauskas, who had a sure dunk. It was all ball, and the Rockets gained possession after the block. T-Mac capped off an 11-2 Houston run to make it 45-37 on another throw-down after blowing past three Cavs on his way to the rack. The Rockets kept a 9-point separation and led 48-39 at the half. One of the reasons Houston dominated and held Cleveland to 11 second quarter points was their defense, holding them to 5-of-20 shooting. In the third quarter, the Cavaliers clawed their way back to within 3 points, 59-56, with 4:09 remaining in the third. But that’s when McGrady and the Rockets bench decided to play hard defense. McGrady and David Wesley did an excellent job defending against Lebron, limiting him to 7 points the rest of the way. Scott Padgett also crashed the boards in the fourth, finishing with 9 boards. Most exciting for the crowd was Jon Barry, who in two consecutive play assisted McGrady for huge fast break buckets. On the first play, Barry grabbed a defensive rebound off a Lebron miss, pushed the ball upcourt, and then executed a behind-the-back pass across half the distance of the court to T-Mac for a two-handed dunk that left the Cavaliers breathless. You can bet that pass will be in the Top 10 plays of the week. On the very next play Padgett stole the ball from Ilgauskas and passed it to Barry, who led the break and went up for a layup, but at the last second faked the shot to throw off a defender in front of the rim, and then passed to McGrady while under the basket in mid-air for another huge fast break assist. Behind three-point shooting from Mike James (three in the fourth quarter alone) and Barry, the Rockets accumulated a 20-point lead and the Cavaliers were all but finished. Yao came in for a few minutes and scored four quick points before the clean-up crew came in. Mike James had the ball in the final seconds but decided to be a classy player and not break 100 points for free Big Macs for the crowd. On reason for the large win margin was the Rockets rediscovered confidence in their shooting touch, hitting nearly 40% from the three point line and 47% from the field. They also out-rebounded the Cavs 48-37. T-Mac was incredible, scoring 31 points on 11-of-21 shooting, his best shooting percentage in quite some time. The other star of the game was Bob Sura, who scored 12 points, grabbed 10 boards, dished 6 times and had two blocks. To read the Houston Chronicle’s post-game analysis, click here. You are currently browsing the archives for the vs. Cleveland category.